If the sound of horses? 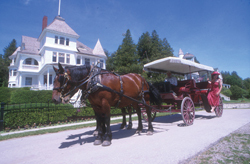 hooves on cobblestone streets puts your mind at ease, then a vacation to Michigan?s Mackinac Island might be a much-needed restful retreat for you. It did the trick for Bill Giles, longtime Hideaways Member, who was welcomed to the island by plenty of horses (no cars here) and plenty of tourists (summer can be quite busy). Bill offers essential tips on how to enjoy your vacation on the island and avoid the crowds. Stroll through streets lined with Victorian inns, hotels, and B&B?s, tour the Governor?s summer residence, and snack on fudge (take your pick from over 14 fudge shops). Head out past the busy town to hike around the wooded interior, tour Native American spiritual sites, or bike on the island?s 6-mile bike path. Get some insight on the island?s best accommodations, from a grand hotel with over 400 rooms to a cozy resort reminiscent of a hunting lodge.